Actually using breakout board that has built in resistor. Using for high level alarm on misting system drain. Used to turn pump on and off for misting system. 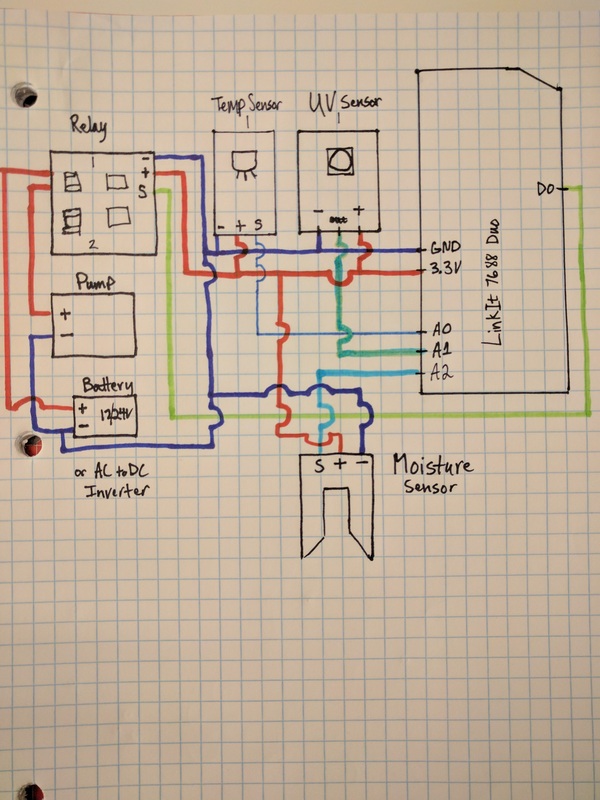 This system monitors temperature, UV index, pump status and drain level for my chameleon's terrarium. The system is built using the LinkIt 7688 Duo, temperature sensor, UV sensor, moisture sensor (for drain level), and a relay for controlling the pump on the misting system. UVB is invisible to the human eye but critical to the formation of vitamin D3 in the skin of reptiles, which allows them to absorb calcium from their food. This system ensures the user will know exactly when their UV bulb is no longer emitting the proper levels of UV. The aim is to prevent Metabolic Bone Disease that can arise from lack of exposure to UVB and promote healthy husbandry. The User Interface is a web page that is accessible to any device running on the same network as the LinkIt 7688 Duo. The user is presented with the current temperature and UV index along with a graph displaying the 30 most recent measurements. There is also a status light for the pump on the misting system. Clicking the light toggles the pump on and off. In the event the drain level for the pump reaches a high level, the light turns red and the pump is shut off. The user can no longer turn the pump on until the high level is cleared by emptying the drain. The user can also setup email notifications for when the drain level reaches a high level. Clicking on the current readings allows the user to view the historical data for that particular type of reading. When the user selects a section of the bottom chart it populates the top chart. This allows for users to view certain sections of historical data in fine detail. Firmata is running on the LinkIt 7688 Duo MCU. This will allow us to access the analog and digital pins using Johnny-Five. 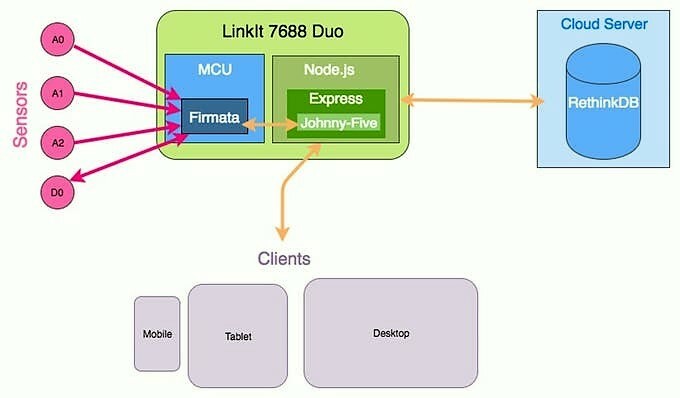 The Node Express server runs on the LinkIt 7688 Duo serving an html page for the client to access the dashboard. Once connected, the user establishes a websocket connection using socket.io and the readings are emitted to the client every second. These readings also get saved in our RethinkDB instance so we can access them later on the historical data page. Here we setup the routes for our express server. Here we set up the sensors using Johnny-Five. These are the socket events for users count and turning the pump on and off. Analog 0 connected to LM35 temperature sensor. Analog 1 connected to UV index sensor. Analog 2 connected to moisture sensor. The hardest part of this project was building the dependencies for the node application. Normally you would run npm install and all the dependencies would be installed for you but this doesn't work on the LinkIt 7688 Duo. Instead you have to cross-build each dependency using their guide here. Docker to the rescue. I wrote a Docker file to do just that. It starts with Ubuntu 14.04, pulls in all the required packages and clones their repo. I ran the Docker file to create the container and then attached to that container. I changed directories into the cloned repo and ran their script to cross build all my dependencies. Below is an example of running the command to build johnny-five npm module which includes serialport. Run the following command from inside the cross-build repo root directory. This would build johnny-five and place it as a tar inside node_modues_mips folder. You would then need to transfer the tar to your host machine and move the contents to the LinkIt 7688 Duo. Place the folder of each dependency in the app's node_modules folder. Using docker to cross build node dependencies. create a database named chameleon_monitor . create a table named measurements . 3. Clone the chameleon-monitor repo. 4. Create a folder called node_modules in the cloned directory. 5. Copy all the dependencies you built using the cross-build repo to the node_modules folder. example of coping express. run from host terminal node_modules folder. 6. Edit app.js and change the variable db_host to match the IP address of your RethinkDB instance. Video of the pump and high level alert. Email notification of high level alert is sent once every hour until the drain bucket is emptied. To enable this functionality I registered an app password for my Gmail account at this link. Then update the config variable in file sendHighAlertEmail.js with your email address and password that was generated from the link above. Do not share this password or commit it to your repo as it will grant anyone full access to your account. High level flow of the software. Hardware schematic of the chameleon monitoring system showing the connections to the LinkIt 7688 Duo, sensors, pump and external power source. Clone to your LinkIt 7688 DUO and run`npm start`. I'm a web developer who loves tinkering with hardware.